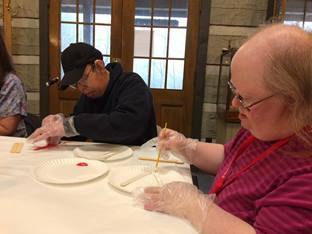 Easterseals Tennessee's Adult Community Center serves adults living with disabilities by providing a safe place to learn and participate in constructive activities and programs. Our training and dedicated staff members offer high-quality care to individuals, while promoting their dignity and independence. Adults living with disabilities benefit by having opportunities for socialization, loving care and support that helps maintain their health and well-being. In addition to giving caregivers a break from their daily routine, our Community Center also provides an affordable alternative to costly in-home or residential care. Day Center clients visiting the Frist Center for the Visual Arts in Nashville, TN. 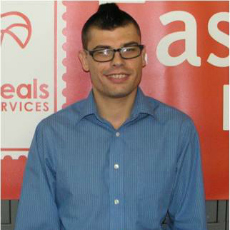 Recreation, social activities, and volunteer experience are just three activities that Easterseals Day Center attendees are involved in through community participation. To meet the needs of our individuals supported, ESTN offers transportation services to and from these engagements.